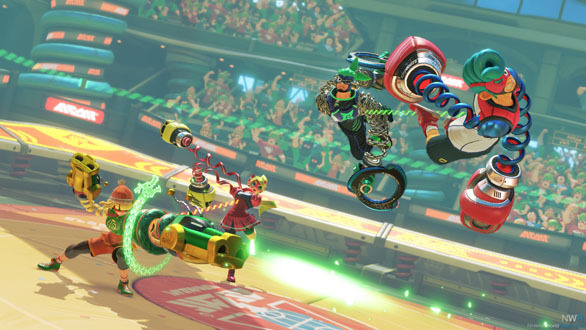 Out of the games shown prior to the launch of Nintendo’s new Switch console, Arms stood out as one that really surprised me. The controls were a lot more stable than things like the old Wii Sports boxing that came with their first motion controller system. Not only that but the JoyCons give a different feel to fighting with the Wiimote and nunchuck. Instead, you have a joystick at the ready for menu options, and can press one of the top bumpers to accept your options. That and holding a JoyCon in each fist to punch feels natural. The bumpers at the top work for jump and dash, while the triggers can activate your hyper attack mode when your power level is full. Each JoyCon is held facing the other, so your thumbs sit on the triggers themselves. It’s actually very comfortable and quite satisfying. That’s not the only way to control the game of course. You can use the JoyCons docked in the holder for a regular control feel and overall use them in the various combinations to play without motion controls. Interestingly you can actually hand a friend a JoyCon as well and play the game two player in that way. 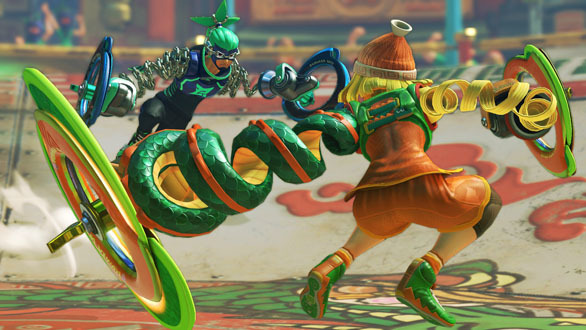 Arms at it’s core is a fighting game through and through. It feels a lot like it is more with the multitude of characters with bright variety among them. It’s easy to think of Arms as something similar to Overwatch in the sense that you have a lot of character choices. Really though Arms is more comparable to regular fighting games without the special attacks that need button combos to pull off. Because of this, newcomers to the game could feel that the title is quite shallow. However, there is something special to Arms that has been lacking in video games over the course of many years and it’s that something that makes the game special. Surprisingly Arms captures the feel and difficulty of SNES era titles. It’s tough to explain the feeling part, but there’s just something there that has the same sense as that first time us old school gamers picked up the Super Scope 6. The feeling of the fresh new plastic controllers in your hands. The almost robotic control of your character. All that sort of stuff. It feels like picking up Battle Clash on the SNES after all these years, and that’s awesome! The coolest thing about Arms is, you will lose! At times it may be because you send out two punches instead of a grab if the motion controls registered a split second off of each other, but in general it’s going to just be because the game is legitimately hard! Before the recent update I couldn’t even get past level three difficulty without some very tactical fighting. Things haven’t really gotten easier per say. They’ve just become more balanced, which is what the patch was mainly about. More of your punches connect now especially. When you’re not using motion controls it feels like you need to guide each shot with the thumbstick. Not like your driving it, but more so that you’re aiming it before you launch each punch. When you get used to it this actually works well. Fighting really gets furious and you need to consider what your opponent is doing. Blocking can be bested by throwing a grab. 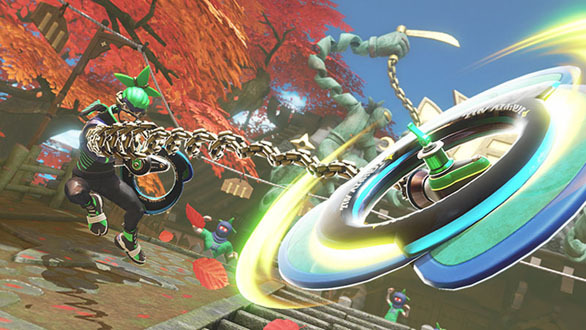 Because of the fighters titular Arms, you can launch a grab attach from a far distance. Meanwhile, punching a grab can knock that down. Don’t punch too much though or your arms will both be extended, leaving your body open. That gives quite a lot of tactic to the game. One thing that still frustrates me and other gamers I’ve seen posting online is the split second decision making when you trigger your characters super attack. You’re about the launch a flurry of punches and instantly your opponent is blocking. It happens more often than not, even on relatively easy difficulty settings. Sure, tactics come into play there. Your opponent can’t block if they have their arms extended, but still, odds are they won’t block every time with instant finesse either. 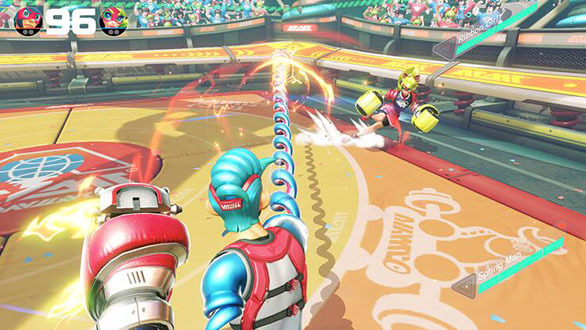 Arms doesn’t just refer to the characters wacky extendable limbs either. It also is what the attachments at the end of their arms are called. These goodies have quite a range to them from various elemental attacks, to ways to guard against your foe. Some are heavy attacks, others are quick light attacks. They even have tactical advantages to them as you can launch light attacks faster, but a heavy attack will actually plow through lighter ones the connect with your opponent. As you progress you’ll collect coins which allow you to unlock new Arms for each character. So you collect Arms to attach to your arms in Arms. Isn’t English fun? 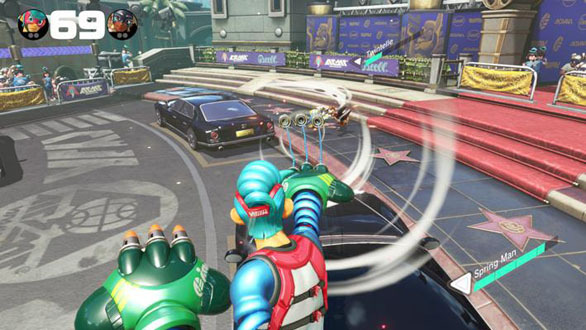 That’s not all, even in Gran Prix mode, the main fighting section of the game, you’ll play volleyball, basketball, and target practice with your opponents. These modes are actually a lot of fun and can be played single player as well in the versus section of the main menu. Basketball sees you using each other as the ball as you’ll struggle with your opponent to grab each other to toss into the net. Volleyball has competitors punching a ball with an explosive orb in it to land on their opponents side. It seems like there may be a time limit to the ball too, so it’s kind of like hot potato in a way too. Target smash mode sees you trying to break more pop up targets than your opponent, like at a carnival. The latest update even adds a mode where fighters compete in an arena containing an object that can turn them into the secret final boss. It’s either for a set time or until you get knocked down. On top of that there’s even one vs one hundred mode which pits you against a wave of one hit fighters that leads up to a battle with the secret boss as well! As I said, the game can feel shallow at first and really there isn’t that much going on here. With Nintendo stepping away from story mode in Smash Bros it isn’t too much of a surprise to see the game has no cinematics. What was a bit of a downer was the lack of voice acting. The preview videos featured Biff, the games announcer, with this deep thrilling voice. That’s nowhere to be found in the games commentary and that feels like a misstep. Typically it’s not a Nintendo thing anyway. Even though you can gleam some understanding from Animal Crossing gibberish, it’s typically just noises. Same with Splatoon characters speaking their own language. 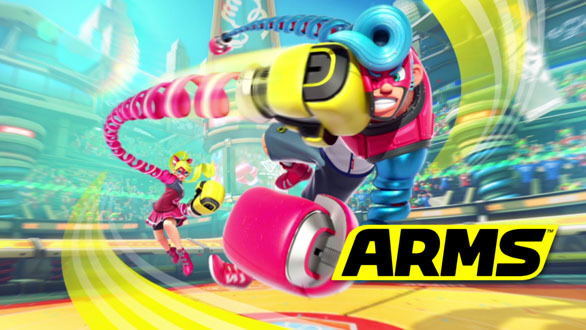 Arms felt different though and while it is awesome, it felt like one more month for some additional voice work and a bit more story / world building could have really pushed this title further. That’s not to say this isn’t a great title! The variety of characters who have different speeds and jumping ability makes this replayable. As does just the fun of enjoying the fights. It just feels like this could have been an even bigger franchise. I get it too, it’s something new on a console that players are still adopting so you don’t want to tie up too many resources. On the same token, it’s more than just a gimmick. Moving on from here is easy. More fighting is an option. The Arms characters becoming super heroes is another. Really it would be awesome if the single player campaign team from Splatoon could throw some ideas into the mix for the next game and do something new with this fledgling franchise with it’s next installment. If you give it a go, you may fall in love with Arms right away. If you don’t, give it a chance. It took me probably about five days to really come around on my feelings for the game and decide that I do really like it. The balancing patch coming out the day after I bought it helped my decision a lot too. The first version of Arms was merciless against me. Yes I was still learning, but it was rough. With the game balanced now I’m proud to say it feels like an old school Nintendo product. For a new franchise, that’s a big deal to someone my age. Giving a player the feeling of nostalgia with something new and unrelated just by style alone is a great feat to pull off. Nintendo has done that here and despite the initial feeling of there not being much here, odds are you’ll come around when you accept that at it’s heart Arms is a fighting game. It does what it advertises very well and you feel accomplished when you win. In a world of casual games, it’s pretty cool to feel that way again.